Armenia is an ancient nation with much to offer the world, but it is grappling with some mighty demons. I find that visiting Armenia requires of me a certain amount of emotional heavy lifting. I remind myself occasionally that I am not here to solve the country’s problems. My purpose in this post is to start exploring these mighty demons, to resume my travel narrative and to give some initial impressions of Armenia. One significant demon is the whole phenomenon of emigration. While Europe faces the conundrum of how to absorb great waves of migrants, Armenia has the opposite challenge – how to persuade people to stay. The population has shrunk from 3.6 million in 1991 to three million today. Less than a third of the world’s Armenians live in Armenia. If you are in a tough neighbourhood, as Armenia is, a falling population is not what you want. Enemies, and the country does have enemies, can seize upon it as a sign of weakness. When last in touch I was watching a wedding video on the Azerbaijan/Russia border. After that, my priority was to go to a real wedding, in Wales. I went back to Baku on the Caspian Sea, then taxis to Tbilisi, flight home for outdoor nuptials of friends in the Welsh sunshine and back to Georgia. Shortly after my return to Tbilisi I met up with my godson Tom, from Melbourne, who joined me for some Caucasus travel. We took a marshrutka to Yerevan, the Armenian capital. 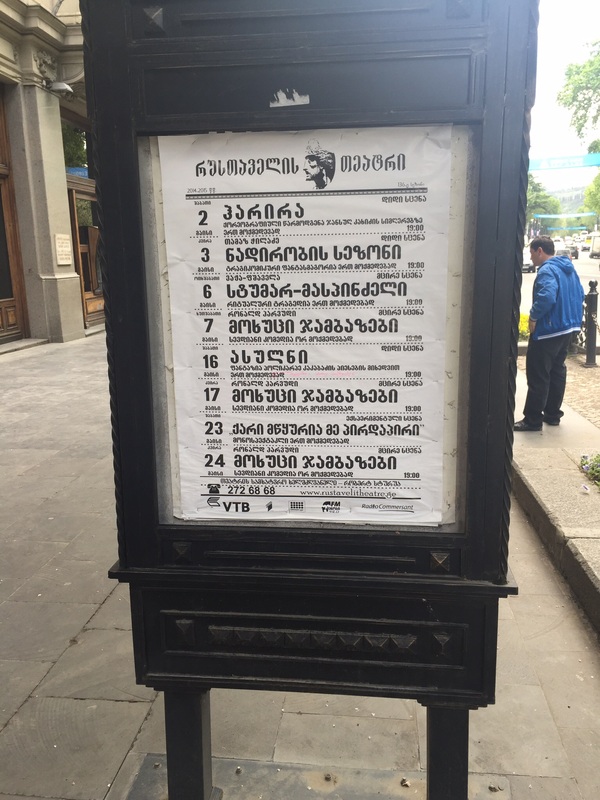 The Armenian alphabet was introduced in AD 405 by the linguist and church leader Saint Mesrop Mashtots in order to translate the Bible into Armenian. Yerevan’s main avenue is named after him and the general view is that Mashtots was one of the pivotal figures in Armenian history. His alphabet provided Armenia with a cultural anchor of the highest importance. Armenians have been through trials which make the hair stand on end just to read about them and the patch of earth which they call their own has shifted and shrunk. But the nation has endured, thanks in large part to a culture based on the book, something you can take with you to a new land. 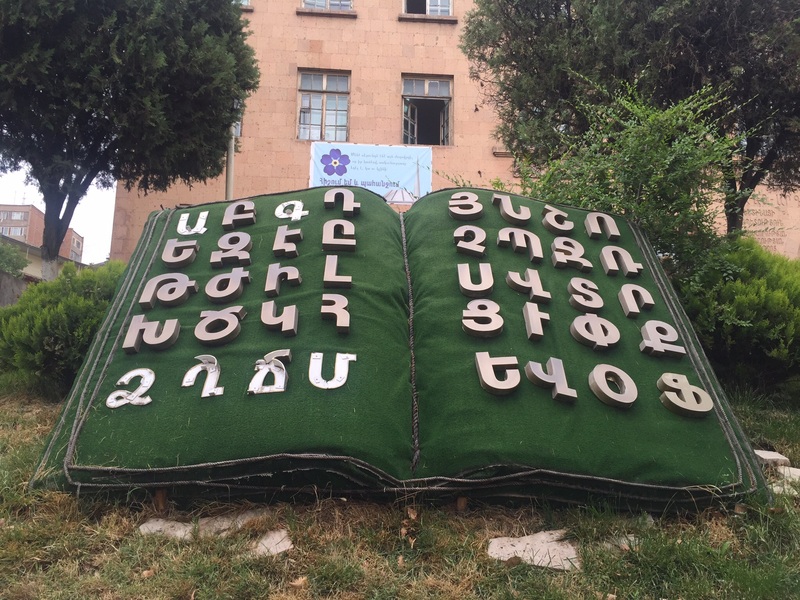 It has even exported its alphabet, since thousands of books written in the Turkish and Kurdish languages have used the Armenian script. So, a new alphabet and for me a new city. Yerevan. This city is older than Rome, but you would never guess that to look at it. Today it is a bustling modern capital of 1.2 million people with a Western pulse and the most impressive traffic jams of the South Caucasus. The architectural tone of Yerevan is 20th century and the building material of choice is blocks of pink “tufa”, rock made from volcanic ash. Next Vahagn took us to the central Republic Square, where dancing fountains and music are the city’s signature attraction of an evening. Nothing old was on the itinerary, for the simple reason that practically everything old has been bulldozed. “The city is nearly 3,000 years old, but few of the buildings go back more than 100 years,” said Vahagn. The architecture is European, much of it early Soviet, but in Yerevan you suddenly know that the Middle East is not far away. As the vulture flies, the killing fields of northern Syria are not much closer to Yerevan (about 670 km) than they are to Tbilisi (about 810 km). But Armenia feels much closer, psychologically and culturally, to the Middle East than does Georgia. Today Armenia is a landlocked country, but once upon a time, more than 700 years ago, it had a Mediterranean shore. The music and the food of Armenia are partly Middle Eastern in flavour. The oud, a pear-shaped stringed instrument, is important in Arab and in Armenian music. War in Arab lands hits home in Yerevan, but does not seem to have been a big driver of emigration. Indeed, perhaps war has worked the other way – some Armenians from Syria and Iraq have settled in Armenia in recent years. 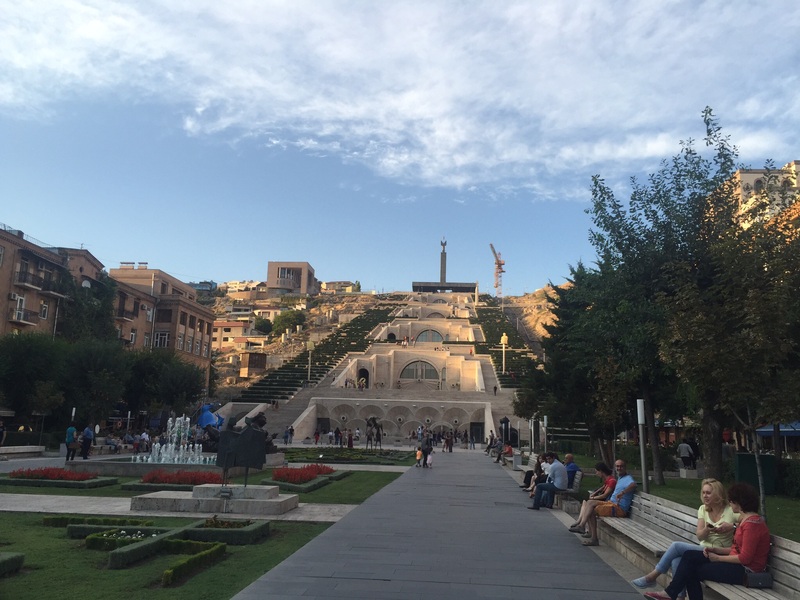 Yerevan has a distinctive quality of its own – lots of street life, classy jazz clubs, good people-watching. A few months ago in a Tbilisi hostel I met a young Japanese man who had just been in Yerevan. He explained to a group of us why he had crossed all Asia to visit the city. At school in Japan, he said, his female geography teacher had impressed upon him that the women of Armenia were beautiful. For eight years he held the dream of going to Armenia to see for himself. Finally he got there and with their permission he photographed a number of Armenian women out and about in the capital. It was a singular tale, but the Japanese traveller exuded the air of a man who had climbed his personal Everest and known the joy of fulfilment. Admiring the beauty of the women is surely a part of the Yerevan experience. Some common sense is needed here – no city has only beautiful people. But there are enough women in Yerevan who turn heads that silence on this matter would be eccentric. Quite often you see the classic Armenian look – patrician nose, flowing black hair, perfect posture. Armenian women, and their sisters in Georgia and Azerbaijan, have remembered what it is to be feminine. They also operate, at least in theory, on a values system which is different from the one which has evolved in the more freewheeling West. The sexual revolution ran out of steaminess somewhere before the Caucasus and their societies, Christian and Muslim alike, are conservative. An ice maiden hauteur can, of course, enhance the charms that nature has given. Anyway, we did move on from Yerevan, in case you were wondering, and we hit the road to Armenia’s southernmost point, to the border with Iran. We left the city in a shared taxi and very soon had a snapshot of the difficulties of life out in the countryside. Our taxi ground to a halt, still in full view of Mount Ararat. All travellers on the road, the main artery to the south, were being obstructed by grape farmers, unhappy about the price they were being offered for their produce after a bumper crop. About 100 people, farmers and motorists, milled around on the road. Police were present but refrained from strong-arm tactics. A man in suit and tie appeared and talked to the gumbooted farmers. I don’t know what he said, but after about 40 minutes at a standstill the traffic flowed again. Protests by grape farmers in Ararat province are something of an annual ritual in September, when the grapes are harvested. Travelling through the Armenian countryside I did not pick up the whiff of prosperity. Lack of economic opportunity is clearly one driver of emigration. 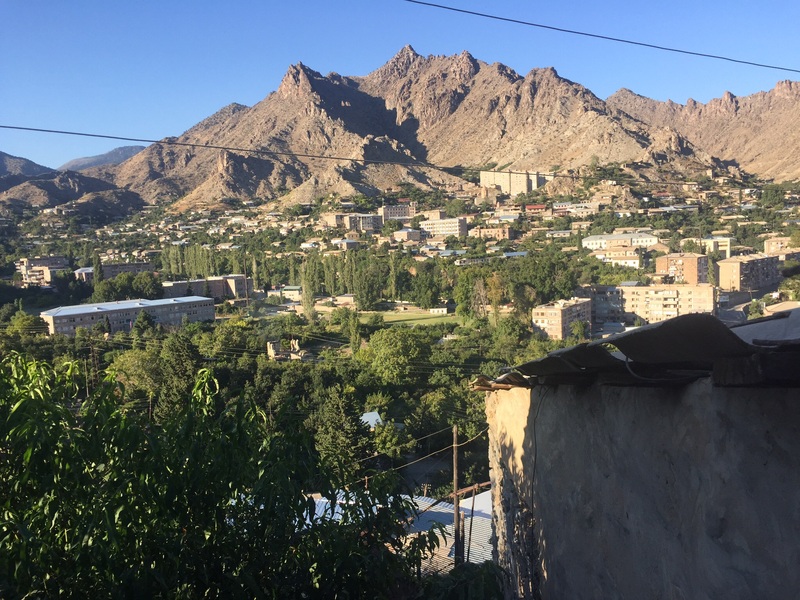 We drove about 250 km through largely barren, sparsely populated hill country to the southern town of Goris, whose population has been steadily falling in recent years. Here we broke our journey and checked into a B&B buzzing with travellers from the Netherlands, Germany and China. Most of us dined together. The Dutch tourists were two brothers, young adults, born of an Armenian father and Dutch mother and making their first visit to Armenia. They too were engaged in what I called earlier emotional heavy lifting. 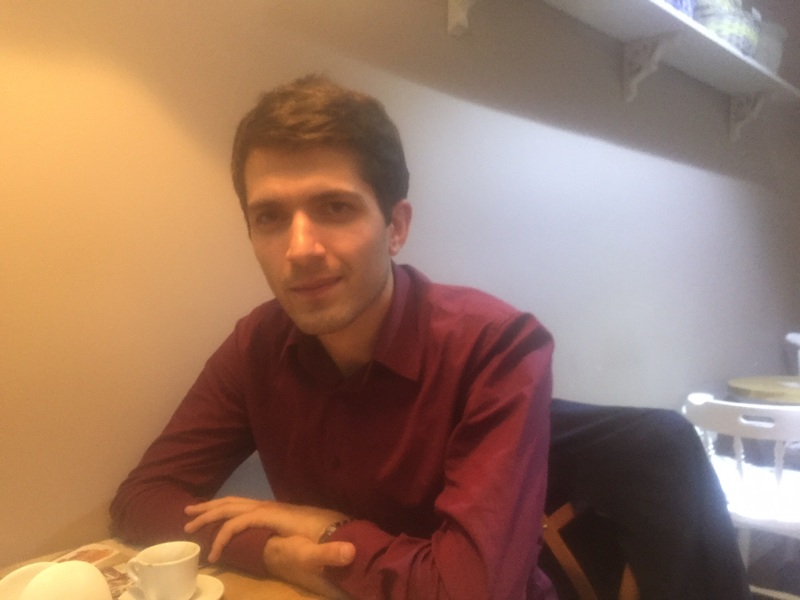 I talked mainly to one brother, Levon Goceryan, born in Delft. He already had some opinions on Armenia. “Their culture is about suffering. Nine out of 10 conversations with Armenians are about the Genocide,” said Levon. “What I miss is the future focus.” Well, you can’t be any clearer than that. Whether you have Armenian blood or not, this country certainly gives food for thought. One of Levon’s themes was that Yerevan, unlike the big cities of Europe, lacked a youth sub-culture. He felt that Armenian youth simply copied their parents and this stunted innovation. The next day Tom and I headed south again through the mountains of the Lesser Caucasus, in two marshrutki and a taxi, to the stunning town of Meghri close to the frontier with Iran. Meghri is a perfect destination for lovers of the desert. It is girt by utterly arid lunar mountains, but the town itself is an oasis with extensive apple orchards. This is a landscape of western Asia. We found accommodation in a house with lime trees in the garden and figs drying on the balcony. From Meghri we drove out to the border with Iran. This was an external border of the former Soviet Union and for all the world it still looks like a Cold War frontier, with high watchtowers and a barbed wire fence. Over on the other side of the river is Iran, neighbour also to Afghanistan and Pakistan. This is the southernmost point of my Caucasus journey.